An unusual white-flowered form of the “Chocolate Vine” in full bloom now at the UW Botanic Gardens. Come smell! 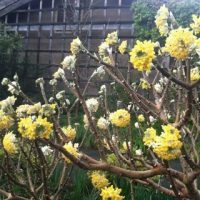 Featured this time last year, we can’t help but mention this fragrant, winter-blooming shrub once again because it’s the best it’s ever looked thanks to a mild winter! Who says there isn’t much color in the landscape during the winter time? The month of February is peak bloom for one of the most delicate, yet tough plants in the winter garden. A much sought after and once exceedingly rare garden plant, this evergreen fern from the mountains and valleys of Chile came to us from the Miller Garden courtesy of Elisabeth C. Miller herself. Abutilon ‘Tiger Eye’ warms up the Douglas Conservatory with shy, but exquisite flowers and leaves that resemble a maple. ‘Little Kitten’ is a pleasant and manageable ornamental grass that stays tidy and it has a soft, demure elegance to it when used singly as a specimen. Planted behind the wooden benches in the Fragrance Garden, ‘Sally Holmes’ is an absolute standout when in full bloom. This delightful, but seldom grown corm from South Africa is looking fantastic in the Soest Garden at the Center for Urban Horticulture. The bold presences of the Evergreen Southern Magnolia is truly a sight to behold in late summer as its creamy white blossoms unfurl, emitting a sweet, pleasantly pungent aroma that fills the warm air. This is the first time we’ve selected an ANNUAL for our monthly plant profile!